HD209458 and HD189733 are the most documented transiting extrasolar planet systems. So what lends them so well to our current observation methods? HD 209458 and HD 189733 are the brightest known exoplanets host stars. This means that there is a good Signal-to-noise ratio making them ideal candidates for transmission spectroscopy studies. Meaning a large amount of information about their size and composition can be gleamed. Transmission spectroscopy is a method used to determine the extent and composition of exoplanetary atmospheres in a transiting system. When a planet transits its star (passes in front of it) the light from the star is partially blocked this gives information about the expected size of the planetary companion. Most exoplanets are expected to possess an atmosphere; so as the planet transits the star the amount of starlight that is blocked will not be a sharp change but a gradual one as the atmosphere blocks a small amount of the light first. 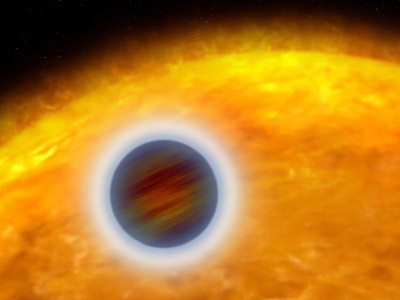 HD 209458b was the first exoplanets to have its atmosphere investigated using transmission spectroscopy. Using the Hubble Space Telescope Charbonneau et al. (2002) detected a 0.02% deeper transit in sodium D lines than in the continuum light curve. This was confirmed using the ground based Subaru telescope on the summit of Mauna Kea in Hawaii by Snellen et al. (2008) (follow up observations are an important process in any scientific investigation and are highly anticipated in all exoplanetary discoveries). HD189733b was the second planet investigated using transmission spectroscopy. Observations measured in transits (from optical to Infra-red) show that the planets radius follows a model for Rayleigh scattering in the atmosphere. Rayleigh scattering is the scattering of radiation by particles that are much smaller than the wavelength of the observed radiation. The detection of HD189733b’s atmosphere was the first ground-based atmospheric detection of an exoplanets carried out by Redfield et al. (2008) using the Hobby-Eberly Telescope near Austin, Texas. They showed that the relative absorption in the sodium D line is roughly 3 times larger than that detected in HD209458b. If an exoplanet has a large atmosphere it is also easier to detect as it will have lower surface gravity and a higher effective temperature. Both HD209458b and HD189733b have a observed effective temperatures and surface gravities that lend themselves perfectly to having large atmospheres and thus the observation techniques used. A summary of the molecular species observed in the atmospheres of both these planets can be seen in the data boxes below. Almost everything known about Hot Jupiters to date comes from the investigation of these two planets, and there is still much left to investigate. Watch this space! MOLECULES: Hydrogen, Sodium, Water, Titanium Oxide, Vanadium Oxide. MOLECULES: Sodium, Water, Carbon Monoxide, Methane.